While I wait patiently for my amazing boyfriend to arrive in London on October 2nd (only 10 days away! 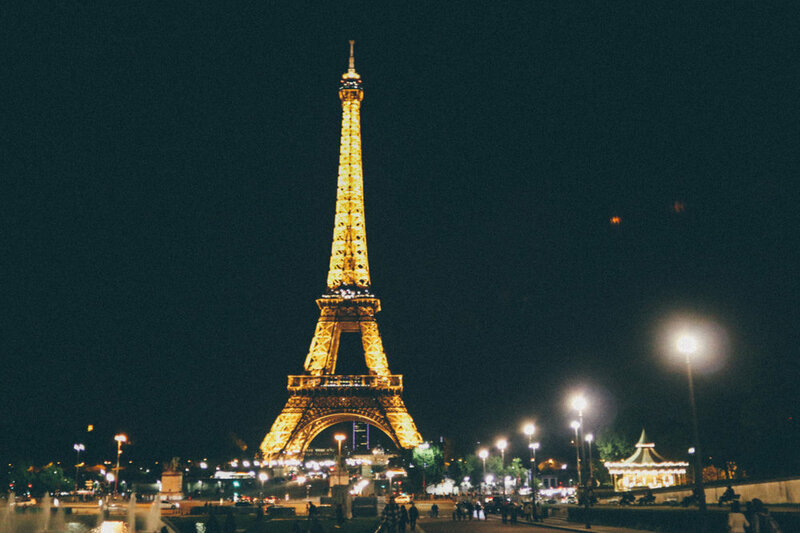 ), I am in the planning stages of our weekend away in Paris, so I thought I'd write a guide for anyone who has ever wanted to take some time to go on an adventure to the city of romance and lights. Your journey doesn't have to be romantic, of course, so you can use this information for a trip with friends or a solo tour. There are a few different ways to get from London to Paris. For a fast train ride, you can take the Eurostar from St. Pancras station, which only takes 2 and a half hours, and can range from $68-180 for a one way journey. If you're lucky, you can get the cheap fare, but they usually sell out fast. If you want to fly, it's only about an hour and 15 minutes in the air, but you have to take into account getting to the airport early and then going though customs and immigration on the other end. These fares usually range from $120 being the cheapest if you go through Easy Jet. The cheapest way to get to Paris is to take a bus. With MegaBus or iDBus, you can get to Paris for about $40 one way. This takes longer (between 7 and 10 hours), but if you get an overnight bus, you can sleep during the ride and arrive in Paris in the morning. The 3 major hostel websites are HostelWorld, Hostels.com, or HostelBookers. I like to check all 3 of them before purchasing, because occasionally, even though they have the same choices on each site, sometimes it will be cheaper through one website than another. I have no idea why, but it's worth the extra ten minutes to check before clicking the purchase button. For example, a double bedroom with a shared bathroom for 3 nights at the Le Regent Montmartre is $357 on HostelWorld, $350 on Hostels.com, and $334 on HostelBookers. While the payment difference is only about $20 between the highest and lowest, if you're trying to budget, obviously the smaller amount is better to go for. This makes me glad I checked multiple sites. Another tip is to check the hostel's website and see what they charge. Le Regent Montmartre charges even less if you go directly through their website, making the amount $314 for the three nights. The only pro to going through one of the hostel booking websites is that you only have to put down a deposit on the room instead of the full amount, which is usually the case when you purchase through the hostel's website directly. Don't forget to check out Airbnb as well. It can actually be even cheaper than a hostel, especially when it comes to booking a room to share. Since writing this post, I've come back to revise this section, because I found a deal for about $100 cheaper by staying at a room in an apartment, rather than going for the hostel. Hostels are better for solo travel or when adventuring with friends. Airbnb works better for couples I'd say. Like London, Paris has a really great underground train system, as well as buses that go all over the city. The Paris Metro system is fairly cheap to ride on. You can buy individual ride tickets for $2.50, or 10 rides for $18. You can also purchase day passes, with the 3 day pass for only $34, which is a really good deal for unlimited travel around the city. Paris is a fairly walkable city, but you will definitely get tired if you're on your feet all day, so catching a bus or train is simple and can end up being very cheap, depending on how many times you want to use the transportation system. Taxis can get expensive, and you'll usually find a bus going somewhere familiar. For me, who has been to Paris twice now, I've already done all of the traditional tourist activities, but never with a loved one, so it will be very different. He's never been to Paris, so I figure it'll be worth it to do everything again, especially if it's with someone I care about. The Eiffel Tower is a must-do. For $18, a youth ticket to ride the lift to the top may seem like a lot, but it is so worth it. It's not like the London Eye (something I think you can definitely skip). The Eiffel Tower is magical. The view from the top is staggering and unforgettable. I've been up twice now and can't wait for my third time. At night, the tower lights up with a sparkling light show. It's delightful. The Louvre is one of the most amazing museums of the world that you really need a whole day to explore. I can say that the $16 you spend will be an adequate amount to be able to view the great art of the world. Obviously the Mona Lisa is in there, but the crowd to see it is usually wild. It's still nice to see in person. It's understandable how one could get lost in there. The building used to be a palace, and it now houses a great amount of history. Right behind the Louvre is the Pont des Arts Bridge, which is famous for its love locks. According to this recent article, the bridge may be getting a makeover soon, to ensure locks cannot be put on it. I'm hoping when I get there in a couple weeks, that won't be in effect yet, because one of my bucket list items was to put a lock on this very bridge. Either way, it's a very romantic bridge to cross, with a nice view of the Eiffel Tower and the Seine. There are plenty more things that can be done in Paris. It is a city full of beautiful things to see and do, so I know my boyfriend and I wont be bored. I am sure that this list from Time Out of 101 Things to do in Paris will definitely be used in our deciding of pursuits for our weekend in this beautiful city.